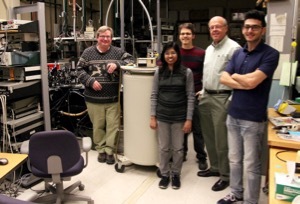 University of Cincinnati physicists are seeing big potential in small semiconductor nanowires for improved optical infrared sensor technologies. With new technology getting smaller and smaller, requiring lower power, University of Cincinnati physics research points to new robust electronic technologies using quantum nanowire structures. The semiconductor nanowires may lead to advances in sensitive electronic technology including heat detecting optical infrared sensors and biomedical testing, all of which can fit inside small electrical devices. Supported by multiple National Science Foundation grants, the UC research team is working with a collaborative team of physicists, electronic materials engineers and doctoral students from around the world –– all to perfect the growth and development of crystalline nanowires that could form the backbone of new nanotechnologies. But to fully apply this technology to modern devices, UC researchers are first looking closely –– on a fundamental level –– at how energy is distributed and measured along thin-strand nanowires so small that thousands of them could theoretically fit inside a human hair. “Now that we know the technology can be developed, we need to understand exactly how the electrical processes work inside the nanowire cores,” say Howard Jackson and Leigh Smith, professors of physics at the University of Cincinnati. “After finally perfecting a standardized process for growing and developing crystalline nanowire fibers with our partners at the Australian National University in Canberra, we have been able to take it one step further. It turns out that these unique nanowire materials have unusually large spin orbit interactions, which the researchers find can conduct electricity really well and may allow the use of spin to enable new computing paradigms. The researchers claim the secret to the success of this multi-collaborative effort is in the combination of materials used to create the nanowires. Initially grown at the Australian National University in Canberra, the nanowires are sprouted from a combination of beads of molten gold scattered across a particular surface. As the process is heated inside a chamber using indium gallium arsenide gases, long microscopically thin core fibers sprout up from between the controlled surface environment. Other material combinations are then introduced to form an outer shell acting as a sheath around each core, resulting in quantum nanowire semiconducting heterostructures all uniform in size, shape and behavior. After the fibers are shipped across the globe to Cincinnati, Jackson, Smith and their team of doctoral students are then able to use sophisticated equipment to measure the electrical and photovoltaic potentials of each fiber along its surface. In earlier research, the collaborative team found extrinsic and intrinsic problems when the fiber cores did not have the outer sheath-like shells. And while gallium arsenide alone is a very common semiconductor, its energy gap is large and in the visible range, which absorbs light. To achieve success in detecting optical heat or infrared, the team says using indium gallium arsenide fibers have smaller energy gaps that can be used successfully in optical detector devices. The researchers say this new nanowire technology is unique because it can turn different wavelengths of light into an electrical signal, and in this case it means turning an infrared light into an electric signal that can be measured. Smith explains that with the geometry of the nanowires you can have a long axis running the length of the wire, which gives you lots of possibilities for absorption as the light comes down, but then you also have this very small diameter. Jackson and Smith found that the nanowire’s ultra-thin outer shells functioned best at widths of four to eight nanometers, which is 25,00 and 12,500 times smaller respectively, than the diameter of a human hair. When looking at the overarching benefits of working with microscopic nanostructures the researchers see tremendous potential for its ability to pack much more high-energy efficiency into small devices with finite space. It’s getting closer to a win-win for everyone, they're saying, especially when this research enters the next stage, bringing it closer to functioning inside electronic and optical sensor devices. Additional contributors to the research are UC physics doctoral students, Nadeeka Wickramasuriya, Yuda Wang and Samuel Linser. Collaborators from the Australian National University in Canberra, Department of Electronic Materials Engineering, are Xiaoming Yuan, Philippe Caroff, Hoe Tan and Chennupati Jagadish. NSF “Major Research Instrumentation: Development of a Mid-infrared Optical Microscope for Investigation of Femtosecond Dynamics of Single Large Spin Orbit Semiconductor Heterostrucutures,” Leigh Smith and Howard Jackson, $492,983 plus cost sharing of $201,798 or a total of $694,781. NSF “MRI: Acquisition of a Ultra-High Resolution Analytical Scanning Electron Microscope for Multidisciplinary Research and Education,” V. Vasudevan, PI, several co-PIs including L. Smith and H. Jackson, $531,693 plus significant cost sharing from the State of Ohio and CEAS and A&S to bring the total to >$900,000. NSF “GOALI: Infrared Nanowire Heterostructures: Fundamentals and Emerging Detector Applications,” Leigh Smith and Howard Jackson, $400,000. NSF DMR “Carrier and Spin Dynamics in Large Spin-Orbit Semiconductor Nanowire Heterostructures,” Leigh Smith and Howard Jackson, $489,551. NSF-IUSE “Enhancing Student Success in Biology, Chemistry, and Physics by Transforming the Faculty Culture,” H. Jackson, PI, $97,148. This grant is provided as a supplement to a presently funded grant for Biology, Chemistry, and Physics so that the Department of Mathematics can be included in these efforts. The currently funded grant is NSF-IUSE “Enhancing Student Success in Biology, Chemistry, and Physics by Transforming the Faculty Culture,” $643,000, 9/01/2014 – 8/31/2018, Howard Jackson (PI). NSF Collaborative Research: Resource and Repository: Broader Impacts of the NSF-CMP Program, Leigh Smith and others $150,000. The University of Cincinnati was the first institution west of the Appalachian Mountains to offer a PhD in Physics. The UC Physics Department is housed in the McMicken College of Arts and Sciences.